Some phones just can't be reviewed in a vacuum, the competition between them is so fierce - and their price tags so high - that they have to be compared against each other under a microscope to determine the best one for you. 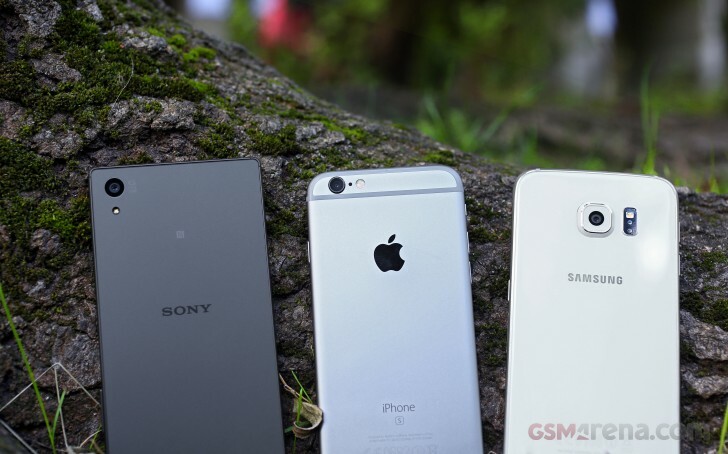 The Apple iPhone 6s and Samsung Galaxy S6 are joined by the Sony Xperia Z5 for this three-way fight. The iPhone 6s and Galaxy S6 have the biggest mindshare amongst consumers and will report back the biggest sales. The Xperia Z5 doesn't enjoy the marketing budget of those two, but is well-known by people interested in smartphones. We'll put the trio through various tests, covering all major functions. Armed with that info, you can pick the winner based on the categories that are most important to your daily routine. Before we delve into the nitty-gritty, let's do quick introductions for each phone. The Apple iPhone 6s is almost like the gold standard for smartphones. A phone can have a better camera than the 6s or a worse camera, last longer on a charge or shorter, it's what many people use it as the yardstick. And with good reason - how many of you don't know at least one person with an iPhone? You've seen it, you've played with it, you probably know its strengths and weaknesses. Android answered Apple's challenge for specs superiority (issued with the iPhone 4) and indeed Samsung made it its guiding design principle for several years. With the Galaxy S6 it finally admitted that design matters too. Samsung's manufacturing capacity and rich profits allowed it to splurge for the best hardware on the market. But has it nailed the ethereal "x-factor" that makes the iPhone transcend its spec numbers? Sony's breakneck "two flagships a year" pace was either going to wear out the company - and the patience of its customers - or it was going to result in the best phone ever. Due to the short schedule, new Xperia Z releases seem to bring only marginal updates. Still, we're comparing against the iPhone and the Galaxy, not against the Z3 or Z4.